On the cover we see a young Munduruku boy, secure in his Amazon rainforest home, clearly a part of his Indigenous world. He knows what he comes from and his smiling, confident expression—along with the monkey comfortably perched on his head—invite the young reader to visit. Tales of the Amazon: How the Munduruku Indians Live is divided into three parts—each told differently, and each related to the others. In Part 1, “The Tale of the Boy Who Didn’t Know How to Dream,” the pajé (healer) names an infant boy Kaxi—“the moon that shines on humanity,” and will groom him to be the healer and spiritual guide to his people. In his training, Kaxi learns to “listen to the voices of our ancestors who speak to us in dreams.” He also learns about the importance of the struggle against outsiders who are damaging the rainforest. Finally, through a prophetic dream he learns how to “guide his people toward their future.” Young readers might giggle at the illustrations of people without clothes on; this could be an opportunity for teachers to challenge all kinds of assumptions. Part 2, “The Indigenous Peoples of Brazil,” reads like a textbook. Short sections include, among others, “Indigenous Lands,” “Linguistic Diversity,” “Cultural Diversity,” “Marriage,” “Music,” “Work,” “Political Organization,” and “Indigenous Rights.” This material is by no means a thorough exploration of any of these issues. But since students at the 6th-grade level (and even below) are especially interested in non-fiction about how people live, these sections can be used as a starting point for student research. 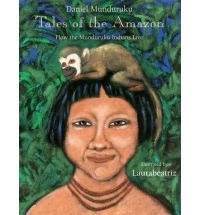 Part 3, “Chronicles and Testimonies,” are brief stories about Munduruku’s life, most of it away from his people. Our favorites include Munduruku’s listening to his grandfather’s stories and knowing that “those ancient myths say what cannot be said”; witnessing a debate between a Christian pastor and a young Guarani man about the nature of God; overhearing two women on a train arguing about whether or not he is a “real Indian”; and responding, both to a teacher who asks him what he does with mosquitoes, and to a child who wants to know if Indians eat people. Portraying the luminous beauty of the Amazon rainforest and the interdependence of the animals and humans who live there, Laurabeatriz’s richly textured, pastel-on-canvas paintings, on a palette of browns, greens and blues, are dramatic and gorgeous. Weaknesses in the text include loaded terminology such as “hut,” “brave,” “warrior,“ “fire water,” and “hostile.” This may have been a function of the translation from the Portuguese. And the suggestions for further reading are dated and unhelpful. But for the most part, Tales of the Amazon is engagingly written, beautifully illustrated and nicely designed, with lots of information that will resonate with young students and lead them to further research. Recommended.